Designed by Patrick Meynier, Box in Box is a new concept in upgradable toilets capable of meeting all requirements for all public spaces and private buildings. Entirely adaptable, developers can get the toilet that is most suitable for their application, their budget and their aesthetic requirements. The number of cabins, the services provided, the mood, colours and finishes area all freely customisable. Designed to be long-lasting, Box in Box reduces cleaning and maintenance operations as far as possible while providing a service which complies with cleanliness and hygiene standards. For incomparable robustness, the internal partitions can be made either from UHPC (ultra high performance concrete) or in Solid Surface with M0 or M1 fire rating. The Box in Box can be delivered on site, entirely or partially pre-assembled (assembly at the factory) depending on accessibility restrictions at the site. The accessibility of public toilets in public places is an important aspect of all clauses of regulations concerning accessibility. The number of available and accessible toilets required is based on the number of people visiting the site in question. Further information is available from the health regulations for your Department. Box in Box provides a solution for all integration and adaptation problems. 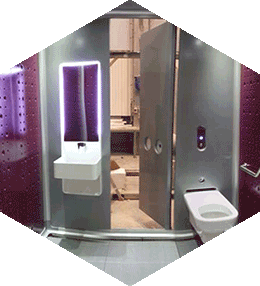 To provide you with greater freedom to design your ideal cabin, Francioli offers a range of customisable modular toilets which will fit your needs perfectly.